Figure 1. Field Cooled (FC, closed circles) and Zero-Field Cooled (ZFC, open circles) magnetization curves of a) diluted (volume fraction, Φ = 0.01%) and b) concentrated (Φ=35%) ferrofluids. In a diluted systems, the (average) blocking temperature appears at 67K while smaller particles continue to behave superparamagnetically down to the lowest temperature. In a concentrated ferrofluid, the blocking temperature has risen to 85 K.
Single domained ferro- or ferri-magnetic nanoparticles with unique anistropy axis (easy-magnetization axis) are superparamagnetic (SPM) in the absence of inter-particle interactions. That is, the magnetic moment of a particle can fluctuate randomly by thermal fluctuations at high enough temperatures, just as an atomic spin in a paramagnetic material. At low temperatures, the thermal energy becomes smaller than the anisotropy barrier energy inducing particles' magnetic moments to be blocked in the direction of the easy-magnetization axis. This blocking of magnetic moments occur at the temperature TB determined by the particle's size and its composition. When nanoparticles are sufficiently close to one another, the random, long-range dipole-dipole interactions create a collective phase at low temperatures. Such concentrated nanoparticle assemblies can be made into regular crystal lattice or in a completely random configuration when dispersed in fluid media such as water, oil, or glycerol. In these systems, the dipole-dipole interaction energy added to the individual partciles' anisotropy energy pushes the 'blocking' temperature higher. In some cases of concentrated, monodisperse nanoparticles in frozen media (called ferrofluids) a magnetic state of Superspin Glass has been witnessed. This state is analogous to atomic spin glass states in which the randomness of spin interactions create frustration among them such that a true ground state can never be reached. The name 'superspin' has its origin in the individual nanoparticle's large magnetic moment (e.g. 104 μB per particle of γ-Fe2O3 with 8.6nm diameter). Emblematic sign of spin-glass behavior such as the critical slow down near transition temperature as well as the aging and memory effects (although small) have been observed in frozen ferrofluids. In our group, we have focused our research effort on the Out-of-Equilibrium dynamics in the superspin glass state of concentrated maghemite ferrofluids. 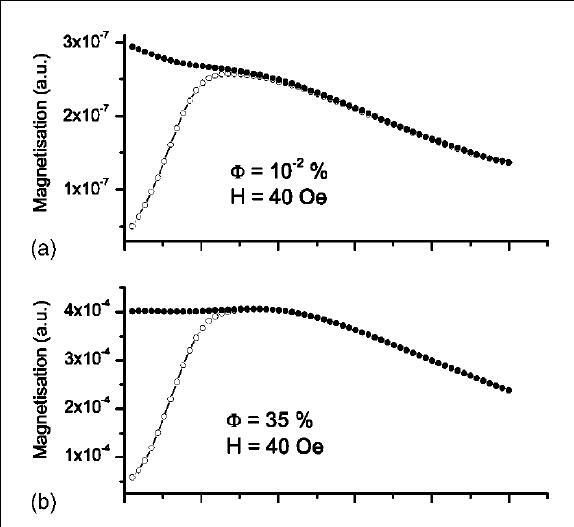 More specifically, we have examined the aging behavior through the thermoremanant magnetization, the AC susceptibility relaxation and zero-field cooled magnetization measurements through which the growing number of correlated superspins has been extracted. Recently, we have investigated the effect of textruization (the anisotropy axis alignment) on the aging dynamics of ferrofluid superspin glass. These experimental studies were conducted using a bulk SQUID magnetometer (CRYOGENIC(TM) S600). 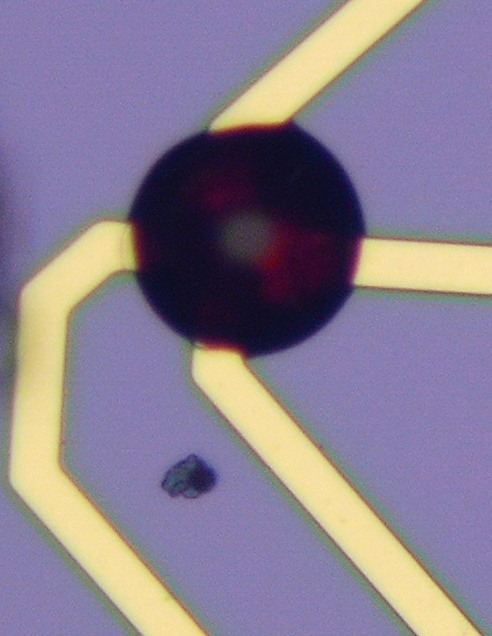 Figure 2: 15 μm diameter drop of ferrofluid on a 2 x 2 μm2 Hall sensor surface. The ferrofluid consists of maghemite nanoparticles (8.6nm diameter) dispersed in glycerol with the volume fraction of 15%. In the past few years, a novel, experimental approach is being developed in our group to investigate the out-of-equilibirum dymamics of ferrofluid's superspin glass state at mesoscopic scale. based on micro-Hall probes. The Hall-probe magnetic field sensors are made of d-doped pseudomorphic heterostructure  are fabricated by ITRON France (V. Mosser, A. Kerlain) and by LSI (Laboratoire des Solides Irradiés, CEA/IRAMIS). We have improved the signall-to-noise quality of these sensors via Spinning Current Technique. Our measured magnetic field resolution is only a few mG/Hz1/2 which enables us to measure not only the local magnetic field change arising from a ~pico-liter of ferrofluid sample (see Figure 2), but also the fluctuations of the magnetic susceptibility of the sample. More details on the Hall sensors will be available shortly on our 'techniques' page. From left to right: Hall sensor with Schottky gate. Right panel: scheme of sample electrodeposited on the top of Hall sensor (courtesy of V. Mosser, ITRON FRANCE), Experimental apparatus for micro-Hall probe measurements, Reduction of the ferrofluid micro-drop sizes from 25 microns to 4microns, an image of a nickel nanowire (courtesy of T. Wade, Ecole Polytechnique). K. Komatsu, D. L’Hôte, S. Nakamae, F. Ladieu, V. Mosser, A. Kerlain, M. Konczykowski, E. Dubois, V. Dupuis, R. Perzynski “Noise Measurement of Interacting Ferromagnetic Particles with High Resolution Hall Microprobes” AIP Conf. Proc. 1129, 153 .